Statue of Clemson founder Thomas Green Clemson by A. Wolfe Davidson. Clemson University was founded in 1889 as a land-grant institution in the upstate of South Carolina. It was donated by Thomas Green Clemson, who willed his house and the surrounding area to the state of South Carolina to create a technical and scientific university. When it first opened its doors in 1893, Clemson was a military institution with fewer than 500 students. Clemson University is comprised of five colleges: the College of Agriculture, Forestry and Life Sciences, the College of Architecture, Arts, and Humanities, the College of Business and Behavioral Science, the College of Engineering and Science, and the College of Health, Education and Human Development. There are more than 80 undergraduate degree programs. Students apply to, and are accepted in, a specific chosen college. Clemson's standards of admission have fluctuated in the past 5 years. When named Time Magazine's Public College of the Year in 2001, the resulting influx of applications, combined with President Barker's push to become a Top 20 school, resulted in a stiffening of entrance requirements. Average SAT and GPA scores raised significantly for the freshmen class. Unfortunately, South Carolina higher education budget cuts in 2002, 2003, and 2004 resulted in a severe lack of funding to Clemson, but this has not affected the quality of applicants in the long term. The incoming freshman class of 2009 was the largest ever with a commensurate number of qualified students rejected. 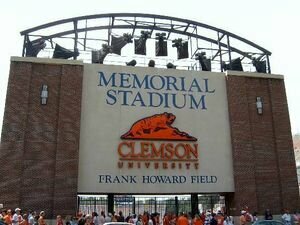 Clemson does not have fixed entrance score numbers, but selects the most qualified applicants each year. Each college has its own demands, strengths and weaknesses. Clemson's Engineering department is very good, though demanding. The Architecture school is very time consuming. Class sizes depend mostly on where you are in your curriculum. Lecture halls with 300 students for Chem 101 or your first Physics course, for example, are not unheard of. That said, generally by sophomore year you're back into classes with 30 or fewer people. Professors run the gamut of personalities, but very few are difficult to get along with or seek help from. Word of advice that is probably universal - if you're struggling, talk to your professor as soon as possible. There are a number of shining stars in the faculty. Eddie Smith is generally recognised by The Tiger as the students' favorite. The social scene isn't necessarily dominated by fraternities and sororities, but they do make up a sizeable percentage (about 21 percent) of the students on campus. There are generally Greek parties aplenty on both weekdays and weekends, and the organizations hold all sorts of formal and informal soirees. This isn't to say that without Greek representation your social life is non-existent. There is a thriving and active GDI population on campus, and, depending on your interests and affiliations, plenty of people to get to know and events to go to. WSBF has the underground on lock and has a number of events for staff and friends. The Rugby Club guys party pretty hard. The list goes on. Thursday nights are recognized as downtown nights, and those of age take the opportunity to head out. Be forewarned: bouncers are extremely strict and will card and catch fake IDs at almost every bar. If you're under 21, hit up the house parties instead. 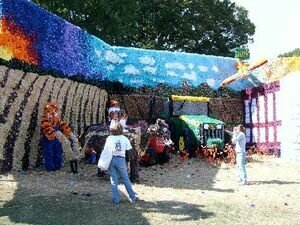 Clemson's reputation as a party school, though, is highly exaggerated (unless you count game days). Visions of kegs lining the streets and drunken debauchery being standard nightlife fare are fiction. The students are relatively hard working and dedicated, and know that they're at Clemson for the education. We'll cut loose when necessary, but rarely if ever forget about studying for exams or writing that paper. The student body is not particularly diverse. A random sampling of kids walking across the Cooper Library bridge will yield mostly white, Christian, southern born-and-raised guys and girls wearing A&F and sandals. We have a large Indian population, especially in the grad schools. Practically everyone is friendly and outgoing. If you are to believe College Prowler, the students are generally attractive. This is not an unfair generalization. Clemson definitely exudes the small town, conservative southern atmosphere. Students go to church on Sundays in droves, dressed their best. A nontrivial percentage of guys wear Tucker Carlson-style bowties. If you're into that sort of thing, you'll fit right in. If you're not, it can be grating at times, though certainly avoidable. Head just a little bit out of town, to Seneca or Central, and you'll find yourself in the backcountry of the Confederacy very quickly. Campus life is dominated by the fall Football season. Highways become impassable, roads on campus turn one way, the streets are flooded with cars and people, and there is orange everywhere you turn your head. Every home game Saturday is basically a campus-wide party and you've got some of the best seats available. Everyone is pretty friendly, there's food and beer everywhere -- take advantage of it, even if you don't like the game. Even the geekiest of computer nerds and most socially inept of us all have a good time at the games. Basketball, baseball, and to a lesser extent soccer are also major sports on campus, though none can compare to the 500 pound gorilla of the football season. It really is a spectacle. Intramurals and club sports are pretty popular. The fields by Fike are usually packed with ultimate frisbee and soccer players during their respective seasons. If you're interested, it's very easy to get on an intramural team. Wikipedia's article on Clemson University. This page was last modified on 7 March 2010, at 15:49.